This past summer I was privileged to work with the Heritage Foundation of Newfoundland and Labrador to learn about and document one mode of transportation that helped develop our province, the make and break engine. This winter, I continue my research into historically important methods of transportation and development in our province by taking an indepth look at Canada’s only heritage animal: the Newfoundland Pony. The Heritage Foundation of Newfoundland and Labrador and the Newfoundland Pony Society are coming together this winter to try to get a better picture of how many of these heritage animals are left in our province. A census will begin to be completed over a twelve week period which will attempt to create a database of all the ponies in the province. By conducting oral interviews and recording details of ponies, we hope to identify ponies that may have been mistaken for horses or other equine types. This will be done by recording physical features of ponies and comparing them to guidelines set forth by the Newfoundland Pony Society. The hope is that there will be ponies which have not been identified as such and with this comes the promise of there being a larger population than currently known. This would add to the overall population of the pony type. The reasoning for this project is really quite simple. Worldwide, the current Newfoundland Pony population is thought to be around 400 ponies and only 250 of these ponies have reproductive capabilities. This number is down from around 12,000 in the 1970s! With the threat of extinction on the horizon it is important for us to recognize all animals which may be of the Newfoundland Pony type. This project will hopefully identify animals who have not been previously documented so that a population can be better determined. This project could help secure the future of the Newfoundland Pony. Max (Maximus of the Avalons’ Lucky Seven) is owned by Peter Halley of Spirit of NL. He is a 10 years old, 14.2 hands high, and weighs approximately 800lbs. Max is a radical changer, referring to the fact that his coat changed in color from the time he was born (as a bay) throughout the seasons for his first five years of life, and is now settled with a beautiful light grey coat. This work also hopes to bring awareness to the plight of the Newfoundland Pony. Many Newfoundlanders and Labradorians do not realize that the Newfoundland Pony exists, or, if they recognize the name, they mistakenly liken it to the much smaller miniature pony types. The knowledge of the Newfoundland Pony is held with the older generations but it is due time that our heritage animal be recognized across our province for the animal that it is. The oral history project, which will be conducted simultaneously with the census, hopes to document the memories of Newfoundland Ponies on our island throughout our history so that future generations can understand the relationship between our provinces development and these noble animals. 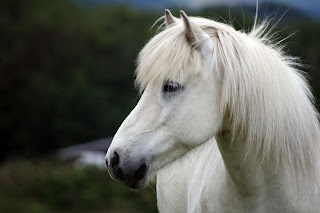 These hard working, diligent, and strong ponies are often fondly remembered by their owners. These animals helped improve the livelihood of many people in our province throughout the ages and were seen as an indispensable part of life until the introduction of modern technology. Used for many work purposes, such as drafting and carting, as well as recreational travel, either being hitched to a sled or being rode, these animals created opportunities for people that would have been impossible otherwise - hauling wood through the forest in the winter or seeking medical attention in a nearby town. Capturing the memories created during such work and outings will provide an indepth history of how the Newfoundland Pony has been utilized in our past and give an indication of how important these animals have been throughout our development. If you own and Newfoundland Pony, or think you might, and would like to get involved with our project, please call 1-888-739-1892 ext. 5 or email joelle@heritagefoundation.ca.